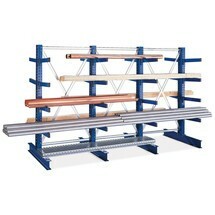 In order for the META cantilever rack to be secure and reliable during loading, it must be anchored to the floor. 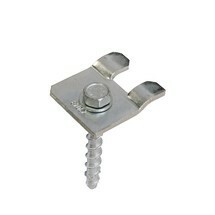 The galvanised foot anchor is intended precisely for this purpose, providing stability and safety. 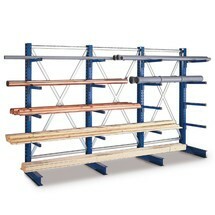 Do you already have cantilever racks with the capacity of which you would like to increase? Then the META cantilever rack add-on units are just what you need. 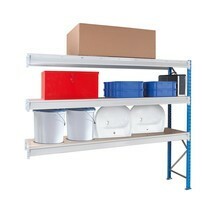 The add-on units are installed by means of simple boltless assembly and will offer you more storage space in no time. Are you looking for a way to expand your existing storage system in a space-saving manner? 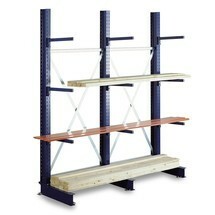 If you already use META one-sided cantilever racks, the one-sided add-on units will be ideal for your purposes. Thanks to this roll-off protection for the META cantilever rack, the loads remain securely on the rack. They are mounted as end plates on the cantilever arm, acting as a stop. 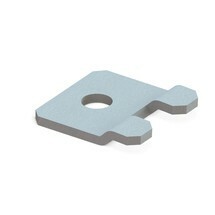 You need this holder in order to be able to attach the roll-off protection to the base section of the cantilever rack. It is bolted to the base section and provides a secure and accurate fit for the plug-in protection. The additional galvanised shelf for the META cantilever rack enables you to sort small goods more easily and thus create more order. It is made of sturdy steel plate and is therefore resistant to corrosion. 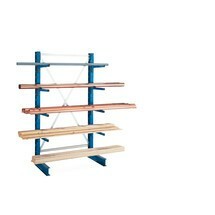 This base shelf forms the bottom storage area on the META cantilever rack which is manufactured from sturdy steel plate and has a load capacity of 500 kg. The delivery includes screw connections. The levelling plate for the META cantilever rack enables you to compensate for uneven floors and bring the rack to the horizontal. It is shaped in such a way that it can be inserted without protruding so that it does not interfere with the operating procedure. Clip-on holders for META cantilever racks are easily attached to the rack arms to provide an additional storage option for your goods and other objects. The end stop for the META cantilever rack enables you to create a reliable edge. It is simply plugged in and reliably prevents moving goods from rolling off. Doing this ensures that the load stays in place.